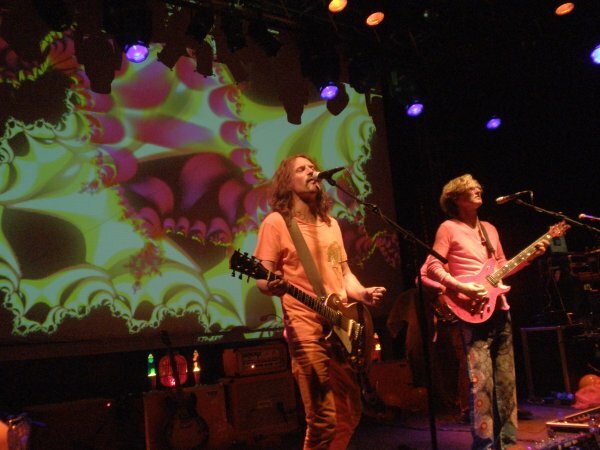 For me it was going to be the second time to see The Flower Kings live in concert, the first time was at Symforce. At Symforce they had just released The Sum of no Evil and because it was a festival they played a small set. In this small set they only one song from their new album. Not a lot but only a few people knew that album and some people had never even heard of The Flower Kings. Now, five years later, it is a full show for me and I am looking forward to an evening of epic songs and a lot from their new album Banks Of Eden. 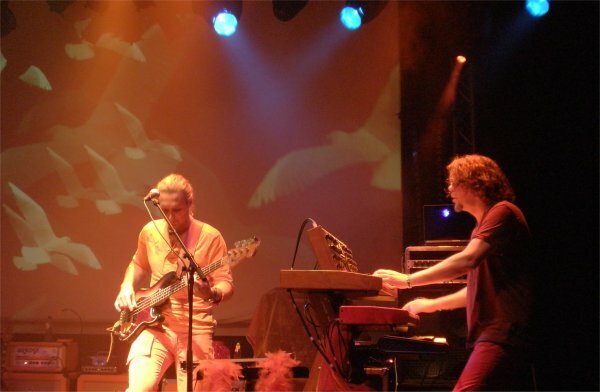 For this tour The Flower Kings are supported by Lalle Larsson, at first the name did not ring a bell but after a visit to his website I found out that he is the keyboard player for Karmakanic. 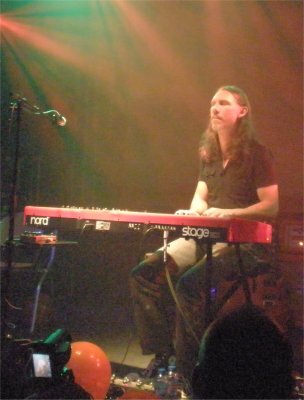 At the centre of the stage was one keyboard, he was not with a band it was just him and his keyboard. Lalle appeared very comfortable, showed no signs of stage fright at all, he calmly walked towards the keyboard and spoke to the crowd. This was the fourteenth gig of the tour, the second in the Netherlands, and he said it was the biggest turn up of the tour so far. De Boerderij was nicely packed but certainly not sold out. I must say that a lot of people turned up for the support act, usually people come in half way or at the end loudly talking and irritating the people enjoying the show, but that was not the case this evening. Even though it was one man behind a keyboard it was very quiet, everybody listened respectfully. This was not a real hard thing because Lalle Larsson provided an interesting performance. He played a nice version of Karmakanics Where Earth Meets The Sky, not an identical one but what can you expect from one instrument. Lalle warned us up front that it was not going to be identical but it was not hard to recognize some parts. For the last song he was joined by Richard Hallebeek, a jazz-fusion guitar player from the Netherlands who plays on Lalle Larsson's cd's. They played Nocturne from Lalle Larsson's latest album Nightscapes with Richard on acoustic guitar. Great performance and a superb start of the evening. 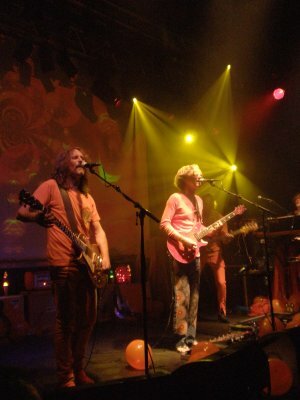 The stage was all set in orange, orange amplifiers and stage decorations including lava lamps, as were some of The Flower Kings themselves. 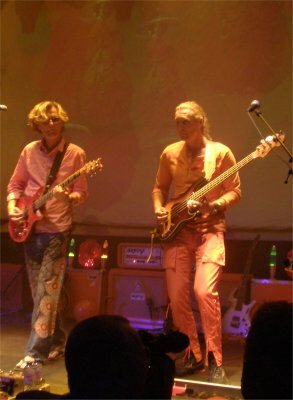 Jonas Reingold and Hasse Fröberg were completely dressed in an orange outfit. 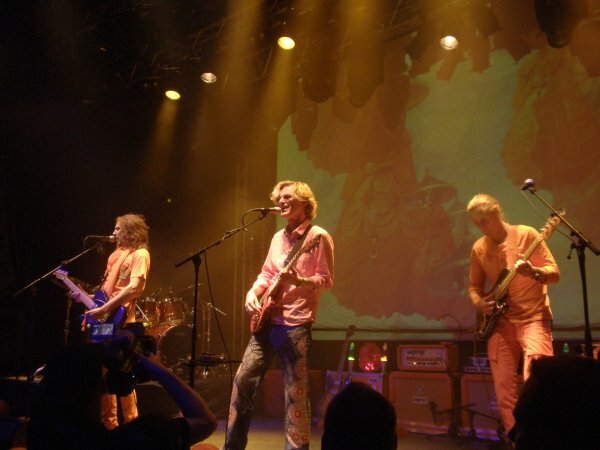 Roine Stolt was dressed in a colorful pair of pants with flowers and in the second part he also wore an orange shirt. At first I thought he was playing barefooted but he wore flip flops. The Flower Kings sure create a colourful appearance. The choice of colour is appreciated in the Netherlands, if you dress orange we love you! As expected they started with the opening track from the new album Banks Of Eden. Typical Flower Kings to start with a song that lasts about half an hour and from the start it was clear the crowd likes epic songs. Numbers is a great song and after 30 minutes for the first time the crowd could put their hands together for these wonderful musicians. Roine wants everything to be perfect and he told the sound guys the kick drums were too loud. My thoughts exactly. I must say that overall it was a bit loud. At De Boerderij they have a dB meter and it turned red lots of times. The bass pedals from Jonas I could feel in my stomach. Standing up front I put in my earplugs and then it was OK. The second song from the new album For The Love Of Gold was a bit easier to process. 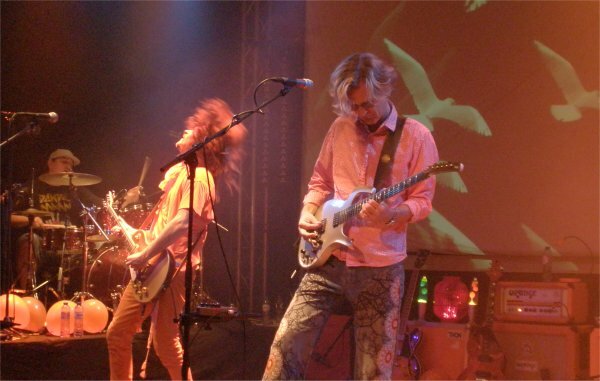 The Flower Kings had five years to come up with a new album and although it is retro prog it sounds very contemporary. Before turning to some older songs it was time for some solo spots. First up was the rhythm section, Jonas and drummer Felix Lehrmann. Jonas is of course the best bass player in prog and together with Felix Lehrmann they showed they are a really tight rhythm section. After a small tune from Cosmic Circus it was time for Tomas Bodin to show his craftsmanship. Solo parts can become stretched and boring but this evening this was not the case. Interesting compact parts and certainly not boring. Next up was Stardust We Are, can you believe that this song is fifteen years old? To close the first set they played What If God Is Alone from the album Paradox Hotel. The Flower Kings took a short and welcome break. I like the music of The Flower Kings but their albums are always a tough nut to crack. It is just that kind of music you really need to set the mood for otherwise it becomes a drag. With the colourful stage and their calm appearance they provided a perfect atmosphere to enjoy the music. The second set started with another old song, Last Minute On Earth from the The Rainmaker album. That is one of the albums I have never heard so this song was completely new to me. iI guess It was not one of the difficult songs, it sounded pretty accessible. In the Eyes of the World is an up-tempo song that fits nicely in between the lengthy epic songs. With epic songs it is hard to come up with a nice setlist, only ten complete songs from an extensive catalogue. It was nicely balanced with a good choice of songs though I think people who have seen The Flower Kings lots of times before might like some changes. A good example is The Truth Will Set You Free, a great song of which they played a medley at Symforce. Tonight I think they played the full version, great song that indeed should be present on the setlist in some form or length. To end the "official" part of the concert they played another song from the new album Banks Of Eden. Rising The Imperial is my favourite song on the album. Great song even though Roine had some trouble with his equipment. Enough trouble to keep him distracted when the band was saying goodbye for the first time. A little bit too distracted when they left the stage but of course they came back for an encore. Roine got a new cable for his guitar because the wireless transmitter was not functioning correctly. He said there was a swimmingpool in his back pocket. Paradox Hotel really rocked the place. Hasse has a great rock voice and it is very interesting to see the interaction with Roine, Roine has a more fragile voice and Hasse can really rock. 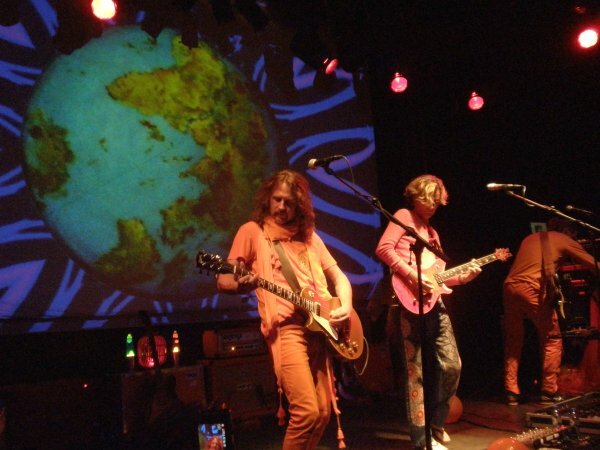 The final song was I Am the Sun from the album Space Revolver. I must say it was not the best choice, not many people knew the song and it is a real mellow track. The mood at the end of the concert was a bit mellow and not as enthusiastic as during some other parts of the concert. You want to out with a bang but it was more like: "is this it then?". The ending is just a minor "flaw" because The Flower Kings put up a great show. The mood of the evening was perfect, opener Lalle Larsson started in a great manner, relaxed and open with beautiful music. And then the relaxed performance of The Flower Kings, together with the great stage, made it a perfect evening of progressive music. I can always listen to the music of The Flower Kings but I will certainly remember the great atmosphere they created on this evening. Come back again and please do not wait another five years! DPRP's Review of The Flower Kings' "The Sum Of No Evil"
DPRP's Review of The Flower Kings' "Banks Of Eden"